Top: Spear's friend and business partner Julie Upton-Wang (left), Spear, their friend Lily Ng (second right) and her daughter Rhys McIntyre (right) dig into the fi rst Schoolhouse Thanksgiving feast in 2006. Center: The staff prepares the newly renovated art center for Thanksgiving dinner early last week. An All-American holiday has become a familiar tradition beneath the Great Wall at Mutianyu. Steve Hubrecht follows his nose to the turkey feast. 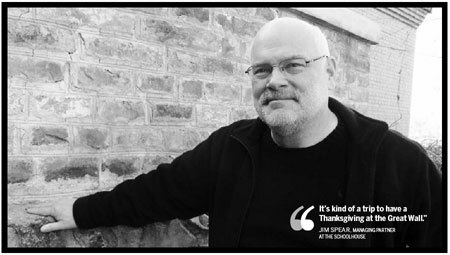 When Jim Spear was growing up in the United States, he moved around a lot, but wherever he was, Thanksgiving was always a big deal. It was a time when whichever members of his family could come together, did. Neighbors and friends were welcome too, and there was usually a place for a stranger. Although Spear's nuclear family was small - Spear, his father, mother and a younger sister - there were usually at least 10 and often 20 or 30 people around the table at Thanksgiving dinner, not all of them relatives. "There was always room for somebody else," says Spear. When Spear was about 10 years old, for example, and his family had just moved to the outskirts of Rochester in upstate New York, from California, there was snow - to young Jim's total delight - but no extended family nearby. So the Spears simply got together with their new neighbors for Thanksgiving. The dinner led to a lasting friendship, and even though the Spears continued to move around the two families remain in touch to this day. Although the Spears' Thanksgiving dinners were frequently in a different location, the scene at each was the always the same - some of the adults bustling in the kitchen, cooking up a storm, others (usually the fathers) tippling a little in the living room, children running around and football on the television. Spear is keeping this spirit - and open seats for strangers - alive some 40 years later, with the annual American Thanksgiving dinners at his Western restaurant, The Schoolhouse, in Mutianyu by the Great Wall, constructed during the Ming Dynasty (1368-1644). Those who have been to the dinners, which Spear hosted on Thursday and Saturday for the fifth year, say he and Schoolhouse chef Randhir Singh have managed to capture, in China, the essence of what is perhaps the most quintessentially American holiday. Diners sit around big, family-style tables, elbow to elbow. Dishes are served from heaping platters, people pass the mashed potatoes, beans, cranberry sauce and gravy back and forth, and Spear - the "father"- sits at head of the host's table. "I'm homesick, I'm an American and I don't fly home for Thanksgiving, so I need a place to go," says Richard Saint Cyr. An American expatriate from Boston who has worked as a doctor in Beijing for about five years, Saint Cyr has been going to Thanksgiving dinners at the Schoolhouse for almost as long. "It's not just the food. What I like about The Schoolhouse is the whole group," Saint Cyr says. "There's actually a community of not just Americans, but a whole lot of expatriates. When you go there you recognize a lot of people, so it actually does become like a second family." It also helps that the food is about as perfect as an American, or anybody else, could hope for, says Ken McManus, an American expatriate who works as a journalist in Beijing and has been attending these Thanksgiving dinners since they started. And although tickets aren't cheap (360 yuan), diners are sent home with extremely generous doggie bags, so it's really two meals for the price of one, says McManus. Having a turkey dinner in a nice, quiet setting just beneath the Great Wall is also pretty cool, he adds. The location is definitely unique and even Spear still finds it a neat place to carve up a turkey. "It's kind of a trip to have a Thanksgiving at the Great Wall," says Spear, who now also hosts dinners at Christmas and New Year's. Firmly instilled with his family's Thanksgiving values, Spear always made sure to mark the day with a special dinner after he left home. He ate Army turkey in mess halls during his stint in the forces. He called his mother for recipes when he went to college. He crammed 30 people into his tiny apartment in Berkeley for the dinner one year. It was at Berkeley that he met his Chinese wife, Liang Tang, and where, about 25 years ago, while working on a doctoral degree in political science and becoming nervous about it, that Spear decided to pull up stakes and head for China after finding a job with a small investment consultancy company. He's been here ever since in a variety of roles, but he didn't leave Thanksgiving behind when he left the US. When Spear first got to China, nobody had an oven large enough to roast a turkey, so he'd order and buy one out the back door of the Jianguo Hotel (official sales were not allowed) and cook up all his mother's favorite dishes to go with it. As his family grew - he has two daughters - he introduced them and his Chinese in-laws to American Thanksgiving. His Chinese father-in-law, in particular, couldn't get enough of Spear's crusty-topped, condensed-soup-laced broccoli casserole. "Food is evocative, so you try to recreate what you had as a kid," says Spear. And, just like when he was younger, Spear kept room at the Thanksgiving table for plenty of people who weren't his relatives. One couple, Julie Upton-Wang (now a business partner) and her husband, became regulars at the Spears' turkey dinners - first in the Spears' old hutong home in Beijing and then later out in the farmers' home the Spears bought and refurbished in Mutianyu as a weekend retreat. "Thanksgiving was always a really important holiday for all of us," says Upton-Wang. "None of us ever wanted to spend it in a hotel. God forbid it would be a buffet. Thanksgiving is about sitting around a table with your extended family." Soon, Upton-Wang and her family were spending the May and October holidays and several weekends a year at the Spears' Mutianyu home to get out of the city. And what a retreat it was - no Internet, no cell phone connection, hanging out, eating country food, hiking and endless games of Scrabble. "We really did get away from it all," says Wang. Others friends of Spears also enjoyed Mutianyu, so much so that they began asking Spear to renovate homes there for them. Spear, fed up with corporate life, had just quit his job, cashed in his stock options and was casting about for something new to do, so he gladly took up his friends' requests. 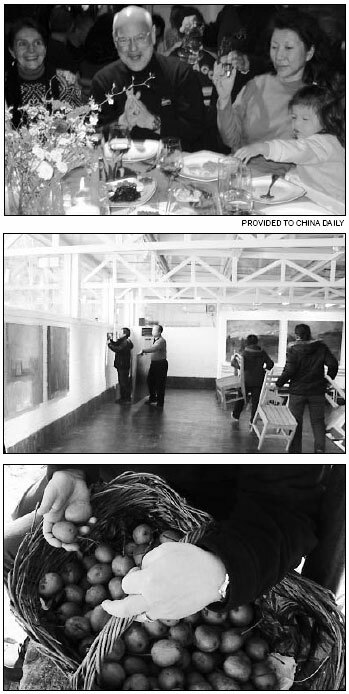 As the number of expatriate country homes in Mutianyu grew, the local government took notice. The village head asked for a meeting with Spear. "I was a little scared," says Spear. But the head just wanted to see if there was anything Spear could do to help the village, which had no good long-term jobs and was losing most of its young people to urban Beijing. Spear hit upon the idea of a Western restaurant combined with an arts room and sold his wife, Upton-Wang and others on it. Upton-Wang readily admits her first look at Mutianyu's old, unused elementary school didn't inspire her with the same vision as Spear. "I was struck by what a mess it was," she says. But they carried on and The Schoolhouse proved such as success that five years later, the operation has expanded to include two other restaurants (the Roadhouse and Xiaolumian), a hotel and conference center (the Brickhouse) and homes to rent by the night in Mutianyu and the surrounding villages. The whole operation aims to be as sustainable as possible and has already won several accolades for its efforts. Forty percent of management staff and almost 100 percent of other employees are from the local township. Food is grown, bought and sourced as locally as possible (the only imported foods the kitchen uses are canned tuna, prepared mustard, olive oil and some dairy products). Old buildings are refitted rather than knocked down. All the rental houses and restaurants have a filtration system built-in so that tap water is drinkable, helping cut back on plastic-bottle use. Spear admits that even with the awards, the operation still isn't perfectly sustainable, but he adds that it is constantly improving small things, which over time adds up to a big difference. Some people have criticized The Schoolhouse for being a for-profit business, Spear says, but he believes long-term economic viability is part of being sustainable and makes no bones about earning money. "We pay fair wages. I have no shame in making a buck. I don't think there's anything wrong with it," says Spear. The Schoolhouse and related ventures have brought about $10 million of outside investment into Mutianyu, he says. "Does that mean everybody around the village loves us? I'm sure not. No. There's friction and there are differences, but I think there's mutual respect," he says. The Schoolhouse also promotes "slow food": Spear had 500 people come out for a Slow Food Saturday this summer, and they went around to different restaurants in nearby villages sampling local food. Some people complained that there was a lot of fried food, but Spear says that's part of Chinese cooking tradition and that "slow food" doesn't involve a specific means of preparation, it simply means that food is harvested, produced and enjoyed locally. "There's nothing wrong with fried food, for heaven's sakes," he says. The slow food concept is about sitting down with friends and family, enjoying food, knowing where that food came from and knowing what's in it, adds Spear. It's a concept that dovetails well with Thanksgiving dinner, which was once again last week enjoyed at Mutianyu by a large group of family, friends and guests in a warm, welcoming atmosphere. "I just love that vibe," says Saint Cyr. The family feeling at The Schoolhouse make it the next best place besides home for expatriates to be at Thanksgiving, adds Saint Cyr. And of those happy to be around the Spears' Thanksgiving table, Spear says it's he who feels luckiest. "I sure have a lot to be thankful for," he says.